Let's talk about my favourite night combo! I feel like I finally found great night moisturing routine. Kiehl's isn't really a new brand to me, I have been using their products for over a year now. At first I wasn't a big fan of the Midnight Recovery Concentrate purely because I didn't feel like my skin have absorb the concentrate overnight. Whenever I woke up I could still feel the oil on my face. After mentioning on twitter that I don't feel like my skin absorbs it, someone have suggested to mix the oil with a cream. Kiehl's Skin Rescuer Stress Minimizing Daily Hydrate have been on my shelf for such a long time, so I thought why not try to mix two great products together! My oh my that was the best decision! When you mix both products together the formula becomes more watery, but the skin absorbs both products really fast. My skin feels really re-hydrated the next morning and I don't get the dry patches around my chin and nose area. The Kiehl's Skin Rescuer Stress Minimizing Daily Hydrate is a lightweight cream, which is also great to be worn under make-up. Stress-minimizing daily hydrator minimizing the appearance of the visible signs of stress on the skin such as dull looking skin and uneven skin tone. I really like the packaging, as it comes with a pump. It's a pricey cream, but as long as it takes good care of my skin I am happy! Kiehl's Midnight Recovery Concentrate is a oil, the packaging is also great too. I am so sad that I've pretty much already used it up. The Concentrate have a very nice scent. Overall I really like both products and I definitely re-purchase once I will use them up. They are expensive, but having good skin is worth all the money! Have any of you tried Kiehl's before? What are your favourite products from the brand? Kiehl's is my all time favourite skincare brand! I fell in love with their midnight recovery concentrate too!! 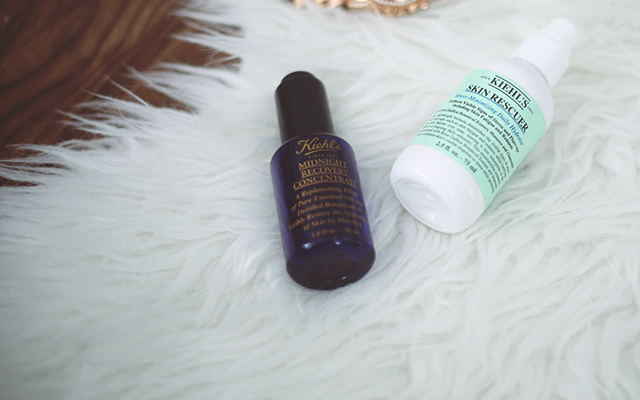 I'm adding these two to my list of products to try from Kiehl's!